4088. Jean Baptiste Thomas BORDELON was likely born about 1670. 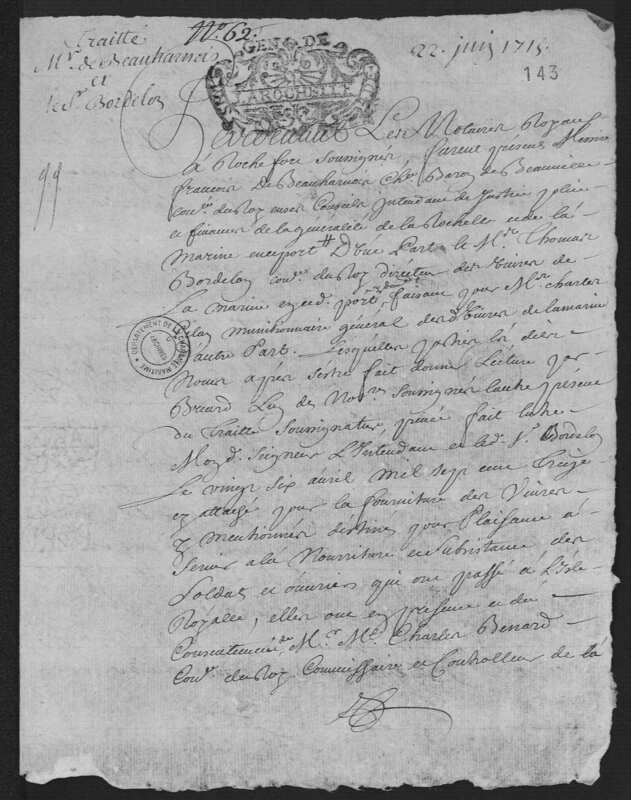 It is now known that he signed (what is believed to be) a marriage contract on 13 October 1690 with Madeleine Richouf de Champgautiers. Reference to this contract is based on a small excerpt in the records of the Archives départementales of Charente-Inférieure which appear to be part of the couple's separation/divorce judgement. 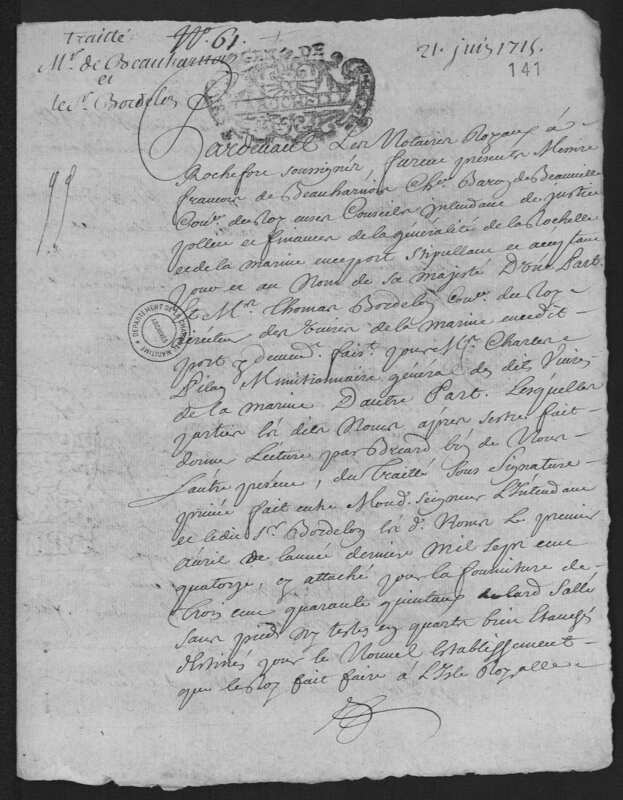 The excerpt states that "Madelaine de Richou, wife of Jean-Baptiste de Bordelou, condemned to pay to the plaintiff 30,000 livres that she has conferred in dowry, April 1717 with interest (contract 13 October 1690)". 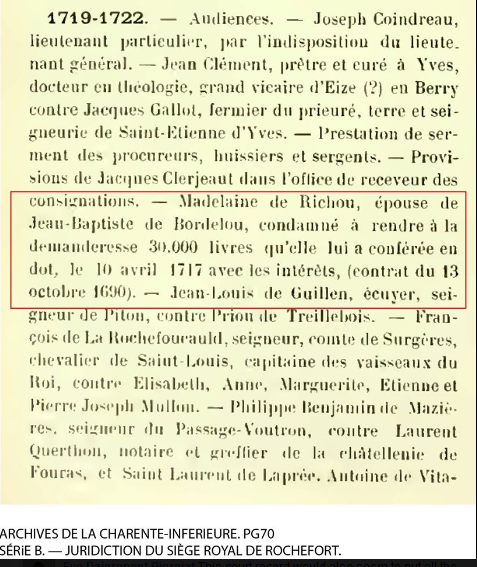 2714 (Richouf-Bordelon Civil Judgement Excerpt) Madeleine RICHOUF DE CHAMPGAUTIERS and Jean Baptiste Thomas BORDELON were likely married about 13 October 1690 but their marriage record has not been found. 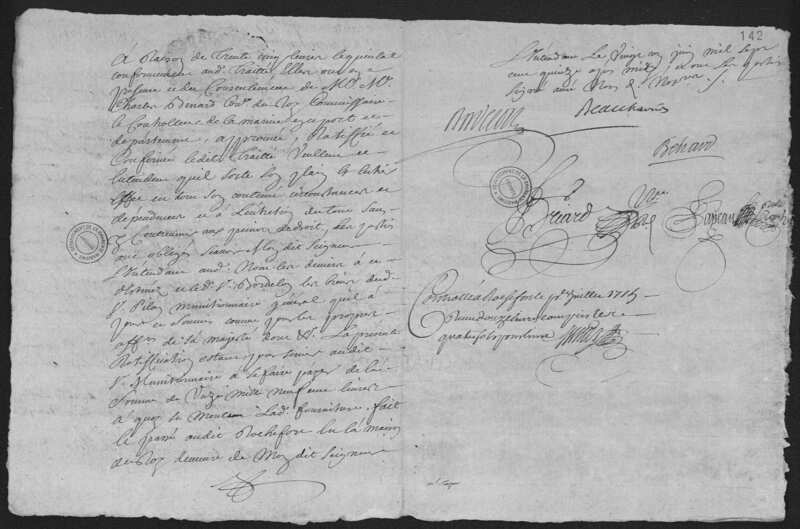 According to "Some Early Families of Avoyelles Parish, Louisiana...Volume I", (Page 17), letters of the Court in Rochefort in 1711-1712 show that JBT Bordelon had left his wife in Le Havre. Dame Richouf "successfully sued her husband for separation of the assets of their community" in 1719. 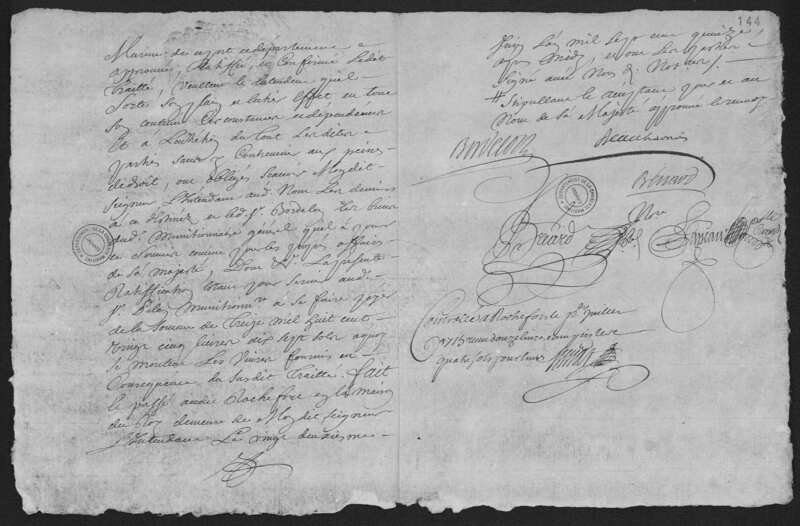 The April 1717 civil judgement mentioned earlier in this paragraph which refers to the couple's (likely) marriage contract, appears to be related to the separation/divorce of the couple and would indicate that the couple was likely in the process of dissolving their marriage by April 1717 although this date might be closer to the 1711-1712 date if those documents become available for examination. In 1696 he was a "Controlleur de vivres de la marine" in Le Havre (Seine-Maritime) (Normandie Region), France (Controller of food supplies for the Navy). In 1711 Jean was a "Directeur des vivres de la marine" in Rochefort (Charente-Maritime), France (Director of food supplies for the Navy). On 21 June 1715, a treaty was ratified (signed on 14 April 1714) between the Intendant of Rochefort and Bordelon (director of naval supplies) for the supply of 340 'quintals bacon saled without food nor head' intended for the "new establishment that the king makes with ...royal island".1899 On 22 June 1715, a treaty was ratified (signed 26 April 1713) between the Intendant of Rochefort and Bordelon (director of naval supplies) establishing that Bordelon would supply goods intended for someone by the name of Plaisance at "royal island".1900 He died after 26 November 1729 at the age of 59. The 3rd child is Thomas Alexis born only 2 years after our ancestor, Gabriel. His mother is listed as Magdelena Richous de champ gautier. This is the first use of the surname extension 'Champ gautier' ('Champgautiers, etc.). Therefore, I suspect that the mother's name on Gabriel's baptismal record was simply spelled wrong and that Magdeleine (or Madeleine) Richouf de Champgautier (du Richouf) was very likely the mother of all children of Jean Baptiste Thomas Bordelon found to-date. It is also interesting to note that neither a death record for a "du Brachon, wife of Jean Baptiste Thomas Bordelon" or a marriage record for a supposed 2nd marriage prior to 1719 for Jean Baptiste Thomas has been found (and I've looked!!) which, in my opinion, lends credence to this theory that there was no additional marriage (once again, this is not a reference to Henriette Rochechouart who is a possible wife of JBT Bordelon later in life). I have also searched for the record of the first marriage of Marthe-Madeleine Bordelon to Charles de Gabaret with the hope that it would provide proof positive that the name of Marthe's mother was du Richon/du Richouf but, to date, I have not located it. If my hunch is correct, it would prove that all of Jean Baptiste Thomas' children were born of the same mother.